A team that wins six and ties one of its last seven games played, should actually be invited to pick up the World Cup. 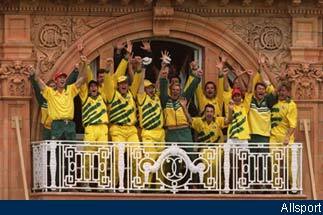 Australia, deserving winners of World Cup 1999. A format which was designed to get the most consistent team to win the World Cup served its purpose. In fact, this World Cup more or less seeded the teams in world cricket. Consistency is the all-important feature one looks for to grade performers; this World Cup did that to near perfection. June 20, 1999, was a big, big day in the calendar of a cricket lover. It just turned out to be a damp squib, after all. A classic case of anti-climax. As it is, it was always going to be difficult for the final to live up to the expectations, after that memorable semi-final. Pakistan disappointed, and brought about a very ordinary finale to a great tournament. Winning the toss and batting first was the simplest of cricketing decisions one had to make at Lord's, until lately. I remember India blundering in asking England to bat first in the 1990 Test match, much to Indian coach Bishen Singh Bedi's annoyance, and seeing the hosts pile up a record - with Graham Gooch scoring 333. That was 1990. The last time India played at Lord's was 1996. England batted first and looked miserable. The Lord's wicket has changed over the years. Who would know it better than Wasim Akram, a veteran of county cricket. Now, here was an example of a captain taking a decision based on his side's strength, which is the right thing to do. But a decision that went wrong as it does quite often in this game. Bit of early help from the track was used efficiently by the Aussies and, in the process, exposed the weaknesses in the Pakistan batting. Shane Warne's returns in the match confirmed that the Indians are easily the better players of spin than their Asian rivals. There is a reason for this: much of Pakistan's lower level cricket is played on concrete wickets. This results in their batsman being naturally better players of pace and bounce than spin and swing. Warne will be especially pleased with his bowling performance as it came against a team from the subcontinent. The subcontinent has not been very kind to this champion leg spinner over the years. He will cherish this one. Pakistan, as we know, are extreme performers. Today was not one of their brilliant days. With a score of 132, they could not even expect a miracle. Even the slightest hope they could have had, of repeating the turnaround of the last World Cup final on this ground, vanished quickly after the break. Adam Gilchrist's tenure at the crease was short, but decisive. 1983 does not happen often. Pakistan, the embarrassed party of the final, return home to, I guess, a hero's welcome. And why not? They came second to Australia, which is not bad... not bad at all.